Layla is a brand I hadn’t heard of previously. They stock a number of nail polish styles, including velvet effect, ceramic and gel effect, so you can choose the type of finish you want for any occasion. 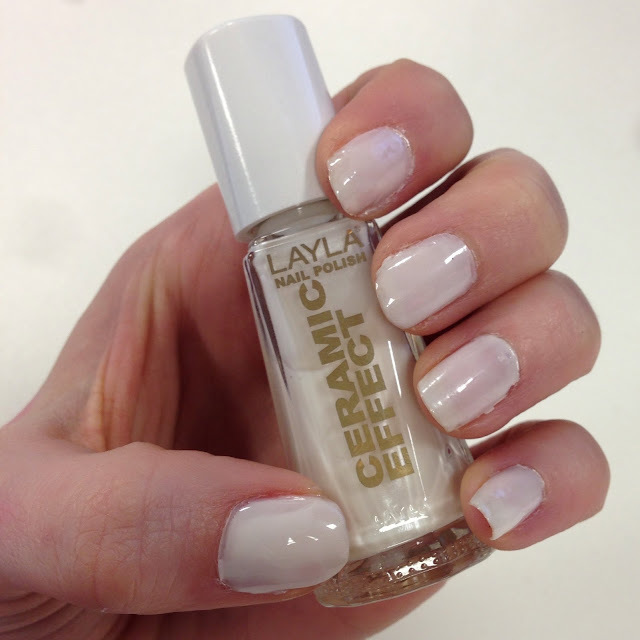 The ceramic effect polish in shade CE01 is gorgeous and leaves a really glazed finish that almost reminds me of icing. Its longevity was also really great and lasted for a number of days. The colour can be built up from a light coating to an opaque cream with a number of coats and is a really wearable shade. I feel this could be lovely for a bright french manicure look. The gel effect in N.11 I really loved. Just one coat covers the nails beautifully and leaves a really bright turquoise blue. The finish is definitely a gel effect and looked really smooth and perfected. It dried much faster than any other varnish and actually really impressed me. Such a beautiful colour for a bright nail. 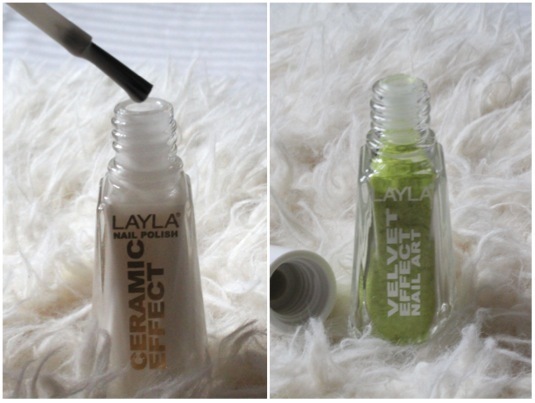 Finally, I must honestly say the Layla Velvet Effect in 07 I am not a fan of. It is literally a bottle with a screw top, that contains little flecks of lime green velvet effect pieces. It is quite hard to get them out of the bottle to be honest, and I feel there should be an easier way to apply them. 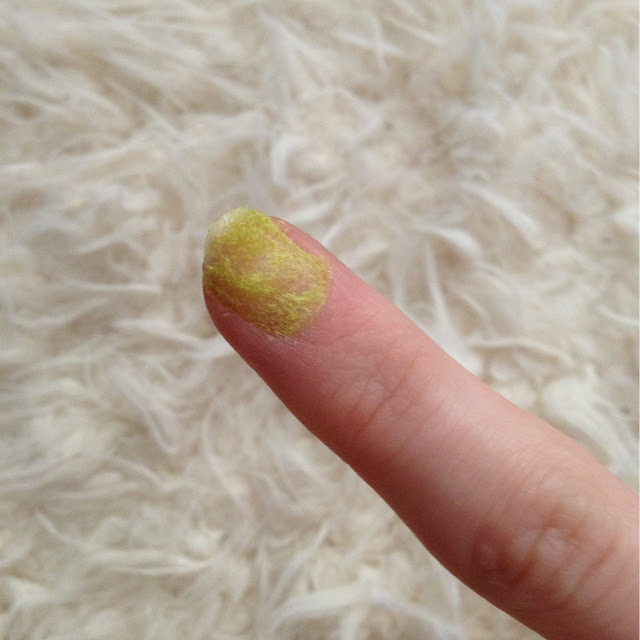 I tried to apply the velvet pieces first of all over clear nail varnish as you can see below. I just applied a coat of clear polish, shook the velvet bottle over the top and then dabbed the velvet all over the nail to compress it. To be honest, the velvet pieces did stay attached to the nails even after hand washing which I was quite impressed by. But overall the effect just wasn’t all that attractive. 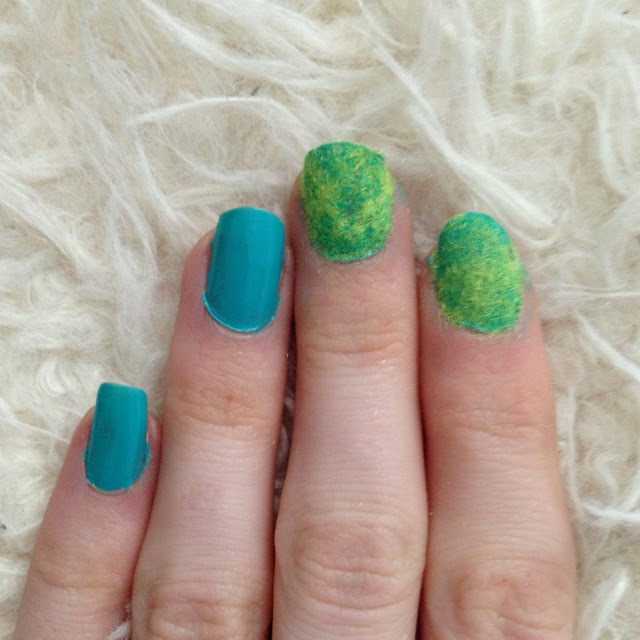 I also tried to apply the velvet effect over the gel effect nails and the finish just reminded me of grass. I dont know, it just didn’t look attractive and just looked a mess. So to be honest, this isn’t something I will be buying in the future and I do feel like it is a bit of a fad. But I guess you can choose whether you think you can do a better job than me of the velvet nails. Overall, I really liked the ceramic and gel effect nails and will definitely have a look at the brand in the future for their innovativeness and gorgeous colours. But textured nails are something that really do cause more hassle than I feel they’re worth, so I will know to stay clear in future. Have you tried any ceramic or gel effect nails? Which would you recommend?